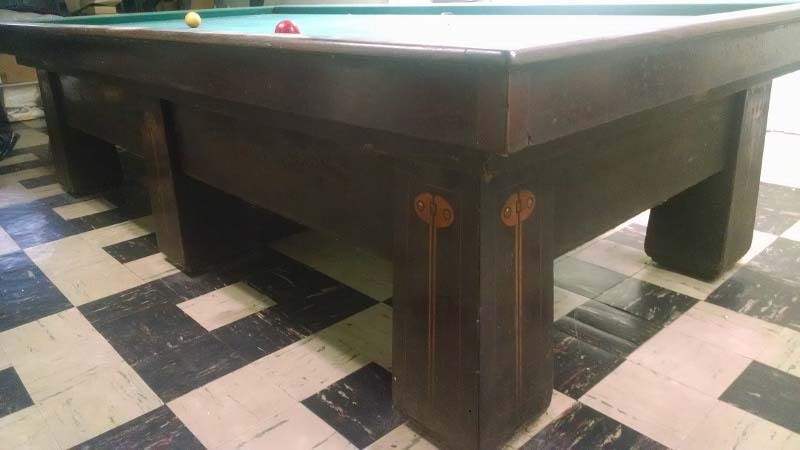 Make a statement with this antique 10’ Brunswick Balke Collender Regina carom table. 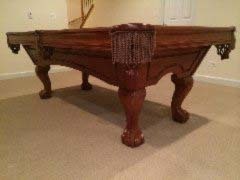 Known as the “semi-Jumbo” framework, this massive yet sturdy 6-legged carom table has a certain ‘Medieval’ appearance to it, and is sure to be the focal point of your game room! Strength and durability are guaranteed when choosing this table, which is built up in compound construction (various types of wood tongued and grooved together) and is able to be taken apart for shipment. The top molding is made of compound built-up construction and measures 4 x 3 3/8”. The reinforcing blocks at the side intersections are secured to the end section by 1/2” iron frame bolts and reinforced by hardwood dowels. The sturdy legs give this table a real feeling of strength, and are made of 5-ply lumber and are 10.5” at the base and taper to 9.5” where they attach to the table. Additionally, the legs are built of compound construction, are tongued and grooved, doweled, reinforced by corner blocks and rigidly built into the end framework of the body. And just in case that wasn’t enough strength for you, the table also has cross stretchers, which furnish the additional bearing surface for the slate. Speaking of slate, the Regina’s slate bed consists of three pieces of Vermont slate that are regulation size and 1” in thickness. 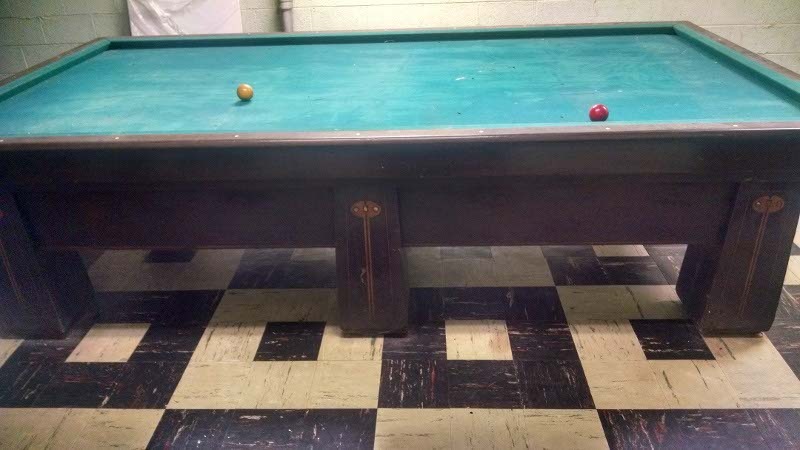 All joints are secured in place by brass dowels and sockets, but you can be certain that no screw holes will ever be visible on the playing surface! The Brunswick Regina billiard table features 3-ply cushion rails, meaning three layers of hardwoods of different grain. This not only provides strength, but also prevents any negative effects of climatic change from occurring. 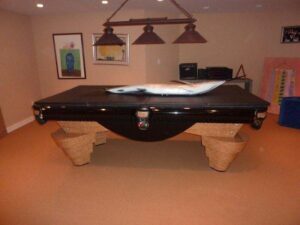 The cushion rails are securely attached to the table with invisible cushion bolts, and covered by blind cushion rail facing featuring a strikingly rich Mahogany figured veneer. 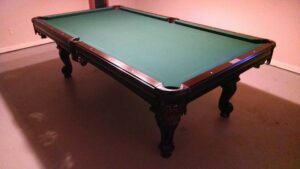 Precision is of utmost importance when it comes to the construction of this 3 cushion table, and you can rest assured that all mitres are accurate and that all corners and edges are smooth and true. The handsome No. 2 Mahogany finish is hand-rubbed to a dull polish, making this table easier to clean than most other types of finishes. 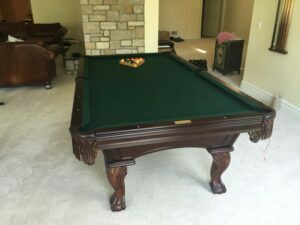 Overall, the Brunswick-Balke-Collender Regina Carom billiard table represents only the finest quality and exudes class. If you’re looking for a table that showcases a timeless design while conveying strength and durability, look no further – this table’s for you!